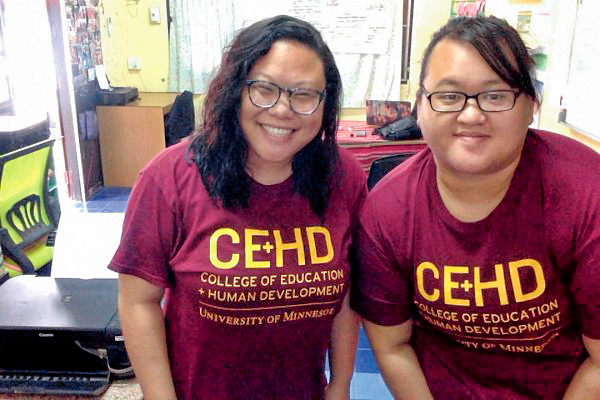 Over the summer, Crystal Lee and Lisa Thao spent eight weeks in Thailand as Mary T. Scholars from CEHD. In Chiang Rai province, they partnered with a local nonprofit on issues of early marriage, teen pregnancy, and human trafficking. They wrote grant proposals, led focus groups, and organized anti-trafficking campaigns at the Center for Girls in Chiang Khong near the Laos, Thailand, and Myanmar borders. Thao, ’18, just completed her dual master’s degree in social work and public policy. Lee is a doctoral student in the higher education program in the Department of Organizational Leadership, Policy, and Development. Both are Hmong, and they worked in several predominantly Hmong villages whose residents are still considered an ethnic minority in Thailand. In late June, a cave near Chiang Rai became the scene of worldwide attention when a boys’ soccer team was lost and a search and rescue team deployed. Lee and Thao watched as the country was swept up in the news coverage. For Thao, watching people react to the news affirmed what she already knew about the community’s close-knit bonds and positive attitudes. Lee notes that the team’s coach and some of the boys were also ethnic minorities, a detail that sparked discussion in their local communities but the media didn’t emphasize. The team’s eventual rescue was a moment of relief and celebration all over the country, including their partner villages, says Lee. The Mary T. Scholars program has funded 20 professional internships all over the world since its founding in 2014. Named for local humanitarian and alumna Mary Tjosvold, ’64, ’75, the program engages graduate students in international community-based work. Learn more about the Mary Tjosvold Fellowship in Community Development.